Care packages for ﻿kids and adults with CRMO﻿! You can request a care package here. Each care package is created especially for that person based on their likes/interests, types of treatments they are receiving, etc. Items that may go in care packages include: CRMO t-shirts; gift cards; books; journals and cool pens; a special toy or an addition to something they collect; drawing pads and pencils; craft projects; homemade rice heating pads (made in a theme that they are interested in, i.e., princesses, dogs, superheroes, etc. ); a stuffed animal or game, and for those that receive infusions, injections or blood draws and have a hard time with these, a product called Buzzy. I was given a Buzzy when I started having bi-monthly injections, and it really helped with the pain. I learned to calm down and deal with getting the shots because I no longer needed to worry about the pain involved in these with the Buzzy. To date, we have sent out 575 care packages. We would like to continue sending care packages, and donations play a big role in allowing us to continue this mission. We are so thankful that care package recipients, as well as others that believe in our mission, have offered to help us through donations, fundraising, and other means of support. We love the pay it foward idea. It feels good to be given a gift; and it feels even better to at some point be able to provide that same feeling to someone else walking a similar path. We are so excited to partner with RARE Science, Inc. in bringing Rare Bears to all CRMO Warriors around the Globe. If you are interested in receiving a Rare Bear made especially for you, complete and submit the form here: www.rarescience.org/kailas-komfort/. All medals come from an awesome non-profit called, We Finish Together. They are donated by a community of runners, swimmers, singers, and triathletes all across the US, and then are decorated with an uplifting handwritten ribbon message and handmade note by our army of volunteers to remind CRMO Warriors that they are supported and cared for, and that they are not alone. Its a wonderful reminder that you are winning at getting through the trials and tribulations that CRMO can bring. Request a medal here. Its not always easy being the sibling of a child with a chronic illness. I walk on both sides of the fence: I suffer from CRMO, and also have a sister who suffers from many very complex medical issues. Siblings often feel left out or even forgotten because their ill sibling requires more care and attention from parents. We want to be able to help make your superstar sibling feel special by sending them a mini care package. Click here to nominate your sister for a special Sibling Care Package. Click here to nominate your brother for a special Sibling Care Package. If you would like to make a donation of items for either sister or brother mini care packages, please contact us. It takes a special Mom to raise any child, but a Warrior Mom to navigate the rare disease world! We would like to show CRMO Warrior Mom's a little love; all you need to do is nominate them here. ​For care information on your Warrior Mom Bracelet, click here. 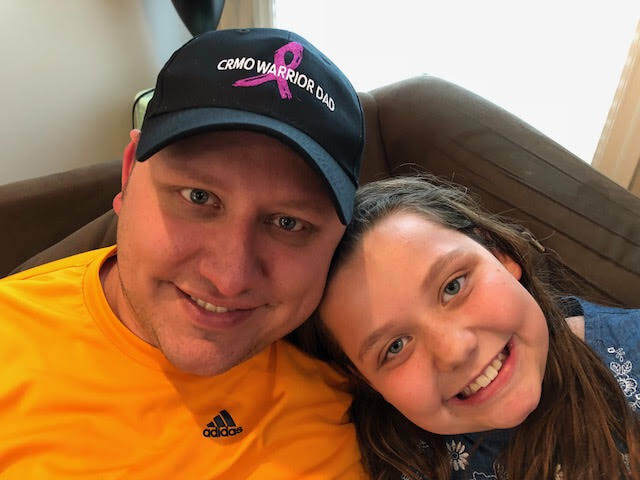 Let's show our CRMO Warrior Dad's a little love; all you need to do is nominate him here. Want to make a donation to CRMO research? There is no way to explain how it feels to be a parent of a child who screams every day in pain because their bones are inflamed and breaking, and there is nothing you can do. As families of children and adults battling this incredibly rare and horribly painful disease, we realized early on how we need researchers on our side to help our loved ones battling CRMO (Chronic Recurrent Multifocal Osteomyelitis). The CRMO Foundation was created to support and improve the health and well-being of Chronic Recurrent Multifocal Osteomyelitis (CRMO) patients and their families by furthering the efforts of life-changing research, increasing access to resources and education and promoting awareness of the disease. Please help them raise much needed funds for this important work and to push for further research and an eventual cure! Your donation gives HOPE to those who are suffering! To learn more about the CRMO Foundation or to make a donation to their cause, please click here to be taken to their website. We had a very successful third annual "Be the Rainbow in Someone's Cloud" mini care package charity drive. This is our way to bring a little sunshine to the kids receiving infusions or dialysis during the month of December at Rady Children's Hospital, where I receive my monthly infusions. We made up and delivered 180 mini care packages and an additional 50 toy chest items, and have heard that they created quite a few smiles! Success!! Thank you to everyone who donated and helped us make this holiday drive possible!